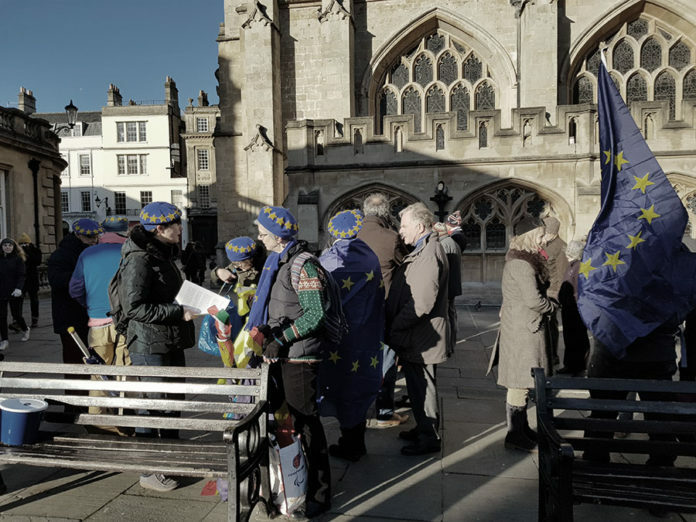 Bath, one of the biggest remain voting areas (Bath & North East Somerset remain result: 57.9%) in the UK staged yet another futile attempt at a pro-EU demonstration. The protest saw around 20 people standing around in EU flagged berets looking wind swept, cold and dull. Ironically, the average age was likely over 60 and the atmosphere would have made a paint staring competition fall asleep. Local German born EU supporting MP Wera Hobhouse has been trying to overturn the largest democratic vote the UK has ever seen, nevertheless has backed motions in parliament that could be seen as contradictory. While she fights to overturn the vote, she oddly argued in her blog that it was the Liberal Democrats that wanted the referendum more than the Conservative Party. So, why do they now want to scrap the result? Ms Hobhouse is not really the model MP, and surprisingly should have been caught up in more controversy with her victim blaming of satirical writers; Charlie Hebdo. The blog post has now been deleted, and can only be found using web archives. Will pro-EU protesters be able to keep the patience of the Brexit campaign, that fought for a referendum for 41 years?